We all have them. Yes, I'm talking about a kitchen junk drawer. Have you looked in your kitchen junk drawer lately? How do you feel every time you open that drawer? Does it frustrate you? Can you find what you are looking for? If you are disgusted by your kitchen junk drawer it is time to declutter and I can help. This is a tip I applied two years ago when I remodeled my kitchen and it has helped me to keep my kitchen drawers organized. 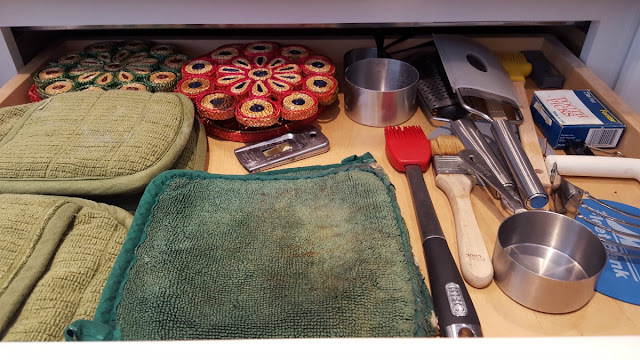 It does help that I have two large drawers that function as my catch all drawers. 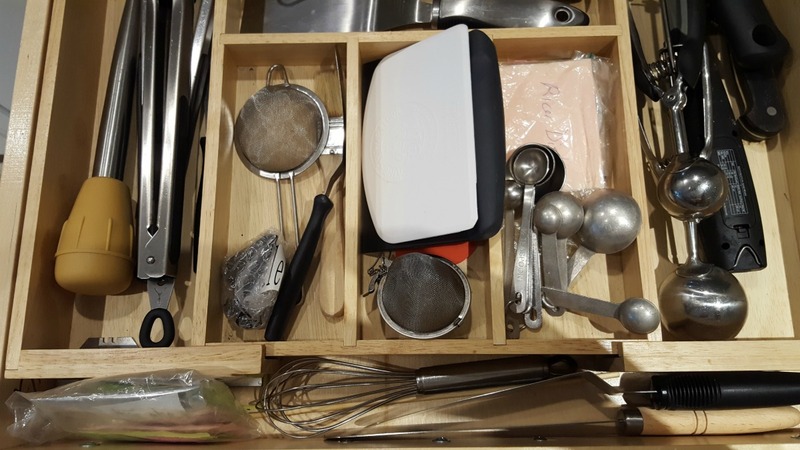 Choose a day to declutter your kitchen drawer when you are in the mood. Don't start your kitchen drawer decluttering when you are frustrated. Purchase a drawer organizer like this in a size that fits your drawer. Get a trash can and a box. Take everything out of your drawer and make a pile on your counter. Wash and dry the inside of your drawer. Fit the new drawer organizer into the drawer. Sort the items on your counter. The items will either go into the trash or the box. Place the things in the box one item at a time so you will make a note in your head of what you put in the box. Now, store the box in a place that is accessible, out of sight. and preferably not in the kitchen. You are done. Yay! Yes, I know nothing is in the drawer. You are going to restock and organize that drawer one item as a time as you need something. Over the next days and weeks, retrieve items from the box only when they are needed in your kitchen. 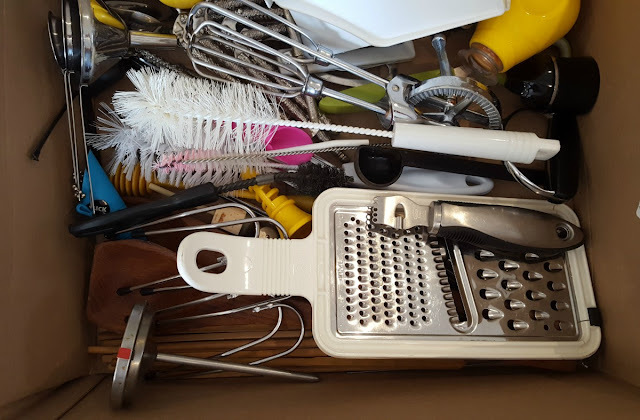 After three months the contents of your box will have decreased and your kitchen drawer will neatly contain your most essential kitchen items. Now it is time to consider whether to discard, donate or keep the remaining items. If you are unsure about letting go of an item, return it to the box until later. I still have a few items from completing this exercise two years ago. Here are the things still in my box. It's time for me to get rid of the items from my box. I went through the box this morning and there in nothing in here I will need. That should be clear to me after two years. Time to donate! 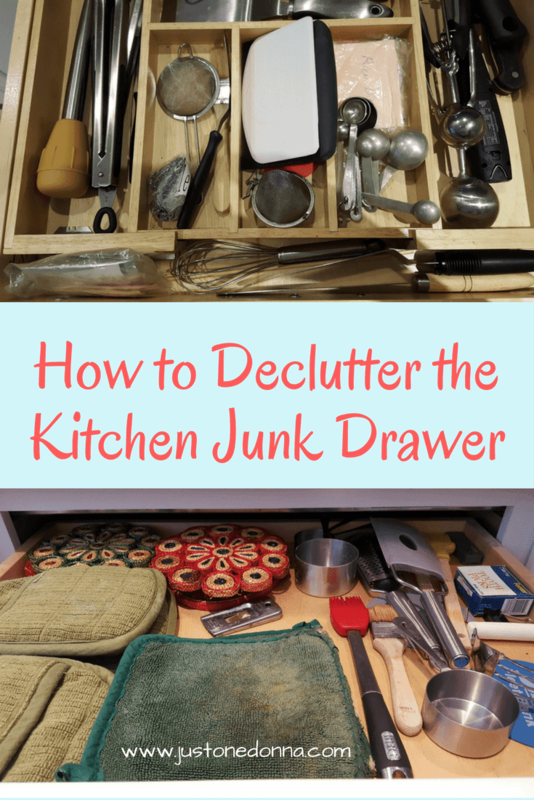 This process helped me to successfully get the upper hand on my kitchen junk. It was easy to do and helped me to be more mindful of the stuff in my kitchen. I'm using this technique with other drawers and closets in my home, too. Thank you for sharing this post on Facebook, Twitter, and Pinterest.